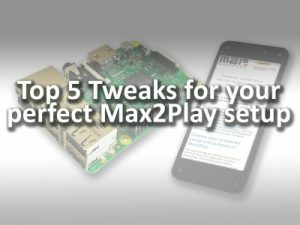 Update 2018: Below the article, we added some great new features that we added to Max2Play Premium since this tutorial was published. Find new opportunities to expand your Max2Play multiroom system even further. 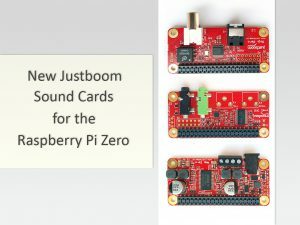 I want to show you how to create a Multiroom Audio Solution with Max2Play, Raspberry Pi and high-end sound cards. In doing so, two aspects are most important to me: It should be reasonably priced and I want to be able to access it from anywhere in my local network. 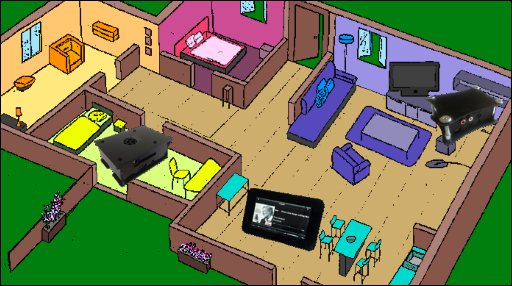 In this example, I want to be able to play music in five different rooms. This should work synchronized and simultaneously. Naturally, you can also apply these examples to other living situations. Since additional wiring in the house is not an option in a renting situation, I aim to use as few cables as possible and thus decide to control the system via WiFi. Please note: This is a presentation of my personal setup. Max2Play can be utilized in a modular fashion to your liking. You can play music as well as videos. It is also possible to use one device with sound card periphery for multiple rooms (using the MultiSqueeze Plugin). 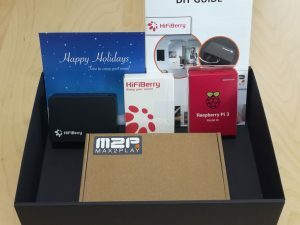 Max2Play supports Kodi (an open-source home theatre software), AirPlay (for Apple devices) and the Squeezebox Server software supports simple integration of internet radio and music streaming services like Spotify. The total price for all five rooms is ca. 820 €. The exact price is naturally dependent on the devices used and complementary articles added. In comparison, a Multiroom system from a retailer like Sonos costs ca. 2300 € for 5 rooms. For a Multiroom Audio Solution installed by an electrician with internal wiring, the costs would be up to at least a five figure amount. I will now prepare the devices. 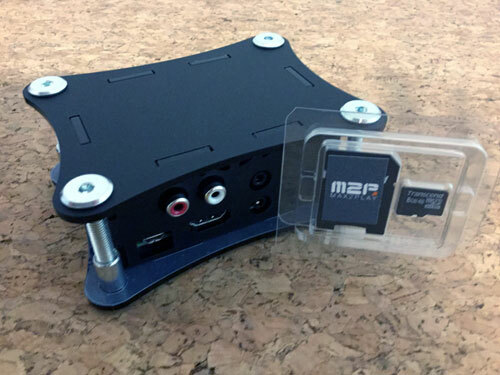 The requirement for getting the individual high-end sound cards is their respective ports. I need one optical output (HiFiBerry Digi+), two RCA outputs (HiFiBerry DAC+ and IQaudIO DAC+) and an amplifier to power my passive speakers (HiFiBerry AMP+/ IQaudIO AMP+). Every room will have a Max2Play bundle. 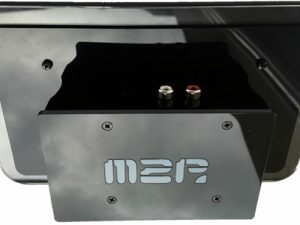 It includes the necessary hardware and the Max2Play Image. 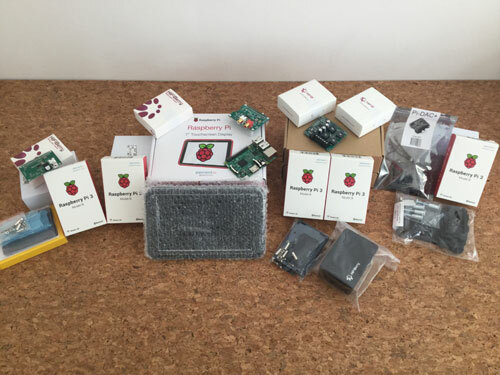 Here, I will use the Raspberry Pi Digi+ Bundle. 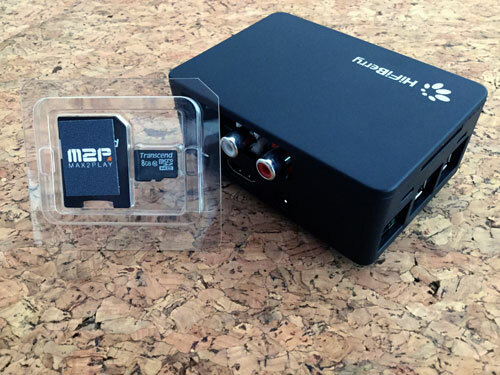 The HiFiBerry Digi+ soundcard has got a optical and a coaxial Input. 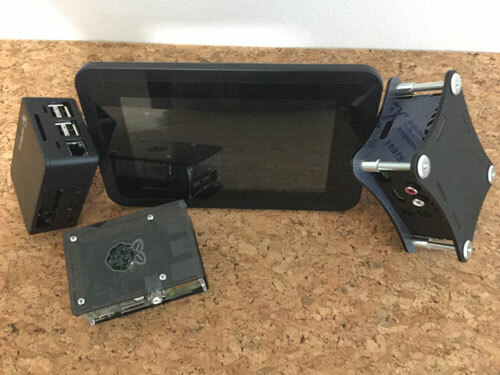 Here, I will use the Raspberry Pi 7“ Touch Display Bundle including the IQaudIO DAC+ as the sound card. Especially in the kitchen, touch screen control can be very beneficial. 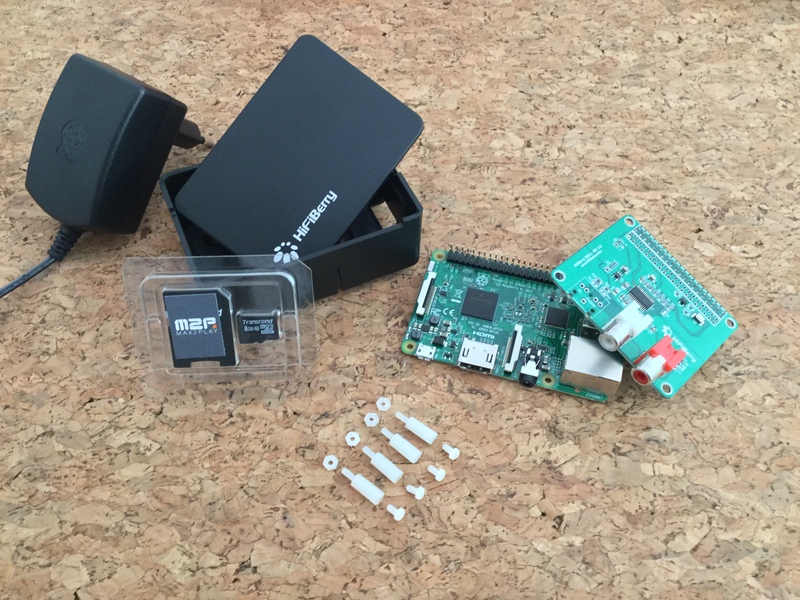 Here, I will use the Raspberry Pi DAC+ pro Bundle. 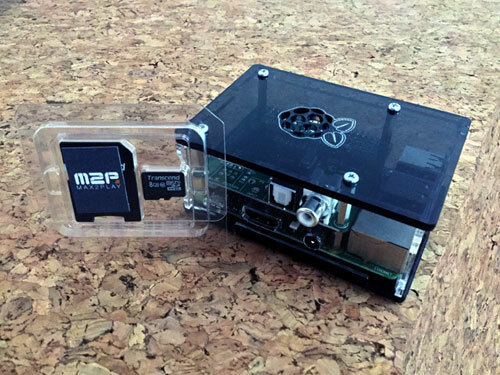 The HiFiBerry DAC+ pro soundcard has got a optical and a coaxial Input. 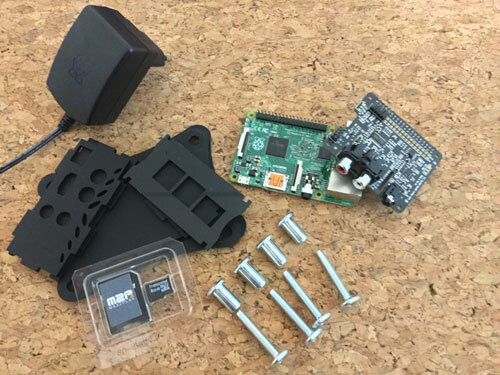 Note: Theoretically, we could use a Raspberry Pi 2 (B) in this and all the other rooms. However, this model requires a WiFi-Stick (additional cost 9,99 €) since only the Raspberry Pi 3 (additional cost 5 €) features on-board WiFi and Bluetooth support. In the bedroom and on the patio both, the HiFiBerry/IQaudIO Amp+ Bundle will be utilized. This sound card is an actual amplifier for the use of the passive speakers. 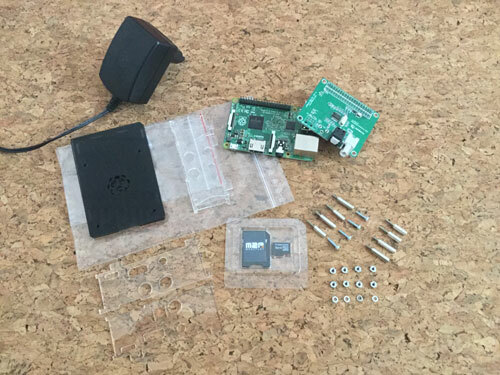 Consequently, this HiFiBerry requires its own power supply, included in the package. I decided on the 8 GB SD cards since I store my music collection on a NAS. For additional charges, the bundles can also be customized with special additions; e.g. a larger microSD card or a different sound card. You should make sure which ports are required for the products before purchase. If questions on this subject should arise, I would recommend the Multiroom-Audio Configurator. 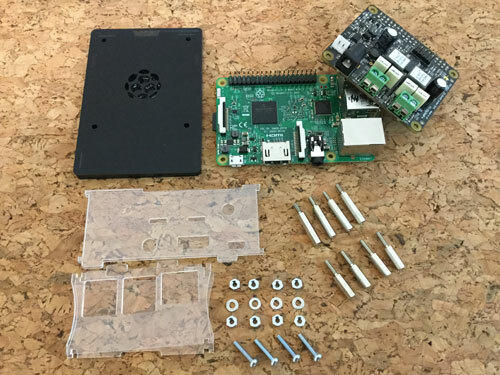 The following is a manual for the first start and setup of the individual Raspberry Pi’s for configuration. You can do this first, for all Max2Play Bundles! 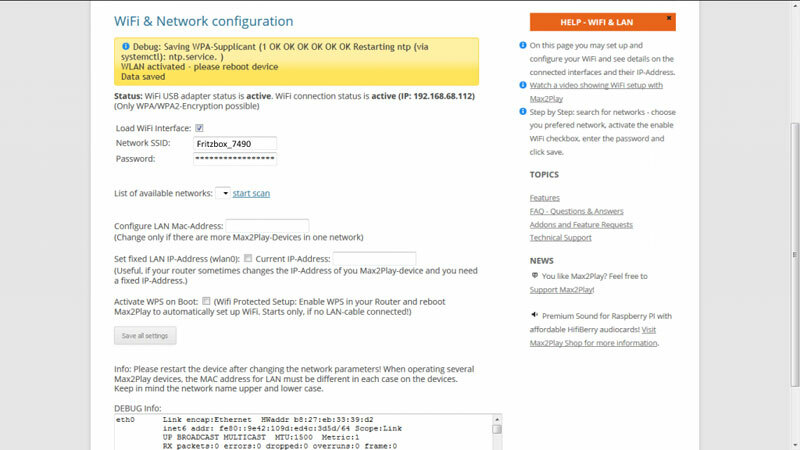 In the browser of a device of your choice (PC, Smartphone, Tablet), connected to your local network, type max2play/ into the URL bar and enter. A graphical user interface will appear, indicating the Max2Play Image you are using (HiFiBerry or IQaudIO). 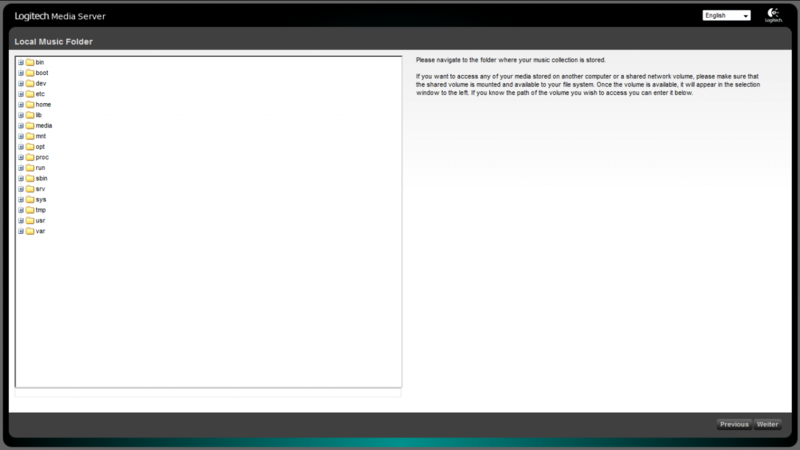 Click on the menu tab „Settings/Reboot“ . There, fill out the boxes for the email address (used during your purchase of the bundles) and a specific name for the respective devices (e.g. „Living Room“; „Kitchen“; „Bath Room“). Head to the start page of the Image and select your preferred configuration of Max2Play „Advanced: A real multiroom audio player that integrates in a Squeezebox environment with powerful options for high-quality audio and a lot features“. This installs a standard setup for multiroom audio solutions. Please note: When using a default image (without preconfigured sound card selection), select the sound card under “HiFiBerry” or “IQaudIO”. This concludes the preparation of the devices. You should now be able to access all devices from any browser in your local network; which brings me to the individual settings in the next step. 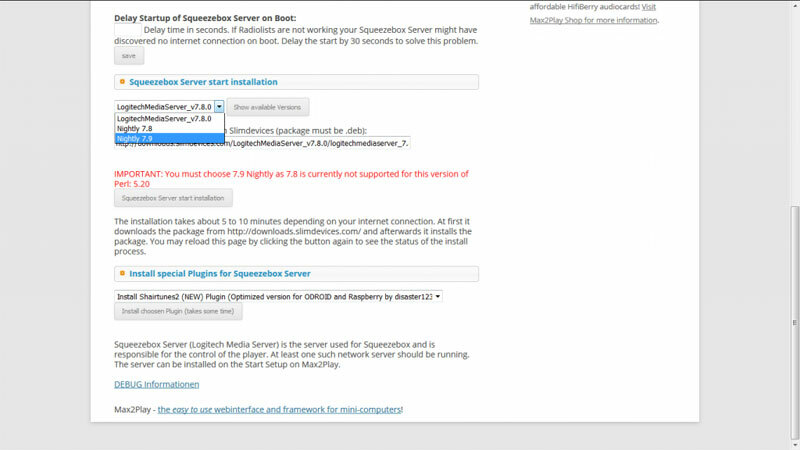 This is the manual for installation and setup of the Squeezebox Server. This manual is only necessary for one Max2Play device (in this case, „/Livingroom/“). I recommend a device with a central location in the apartment. Head to the menu item „Squeezebox Server“ and install the version 7.9 nightly. The versions are displayed after a click on the button „Show available versions“. Select and click install. This installation can take a few minutes. Click the button “Open Web Administration“. This opens up a new tab in your browser. 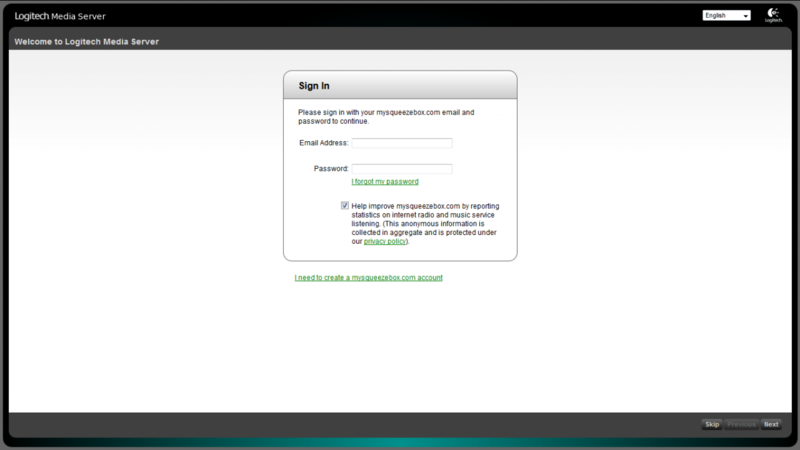 This new tab will first display a login window. No worries, a registration is not required. You can skip this page on the lower right corner. Skip the other two pages as well (for adding music & playlist folders). This concludes the installation of the Squeezebox Server. Now, all that is missing, is the correct software to use the players. This is the job of Squeezelite. Squeezelite comes preinstalled on all Max2Play Images. These settings also have to be done on the device with the Squeezebox Server. 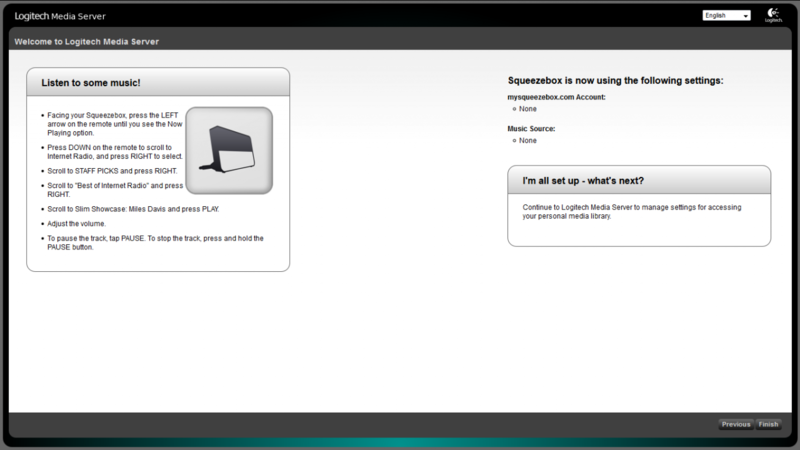 Head to the Squeezebox Server device (here: „Livingroom/“) and open the web administration. You can already select items like radio stations. When the server is running, you can see the individual players in the top right corner and select them to use and configure (see image). Finally, everything is set up and the administration is accessible in the browsers of all your devices. 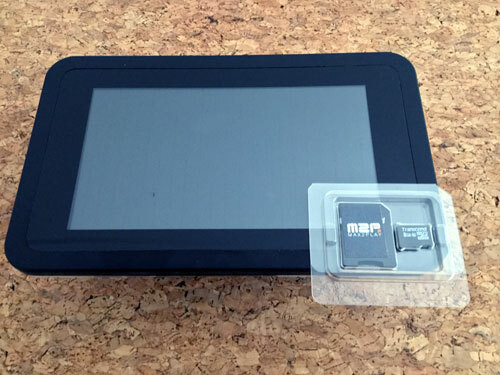 The Max2Play devices do not require any further configuration. The Squeezebox Server is usually accessible through the port 9000 (e.g. : „Livingroom:9000/“ in the URL bar). You also have the option to control the Server with Remote Apps like iPeng 9 (iOS) and Squeezer (Android). These Apps also offer a simplified design, optimized for mobile devices. Use Bluetooth either to pair a Bluetooth speaker as an additional player in your multiroom system or to pair your smartphone or tablet for direct audio input to any and all players in your Squeezebox Server with a special channel. 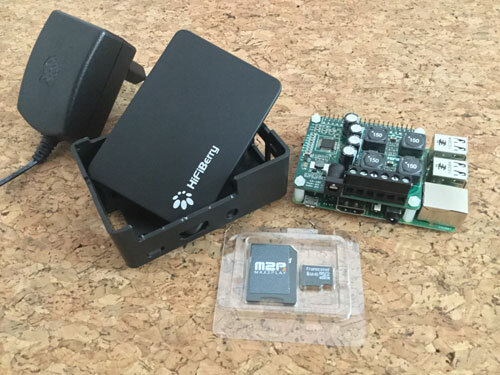 Our head developer shared some great use cases to integrate the open Squeezebox system into any existing home automation interface in a detailed article. 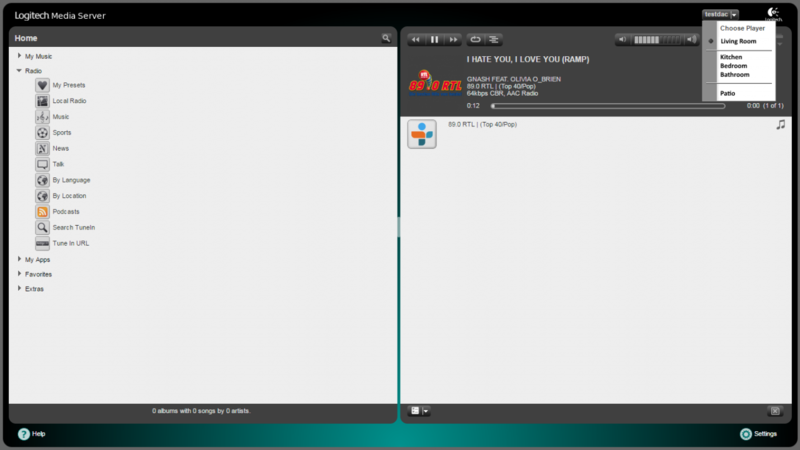 The example applications he shares are his bedroom and bath audio systems under Max2Play Premium. 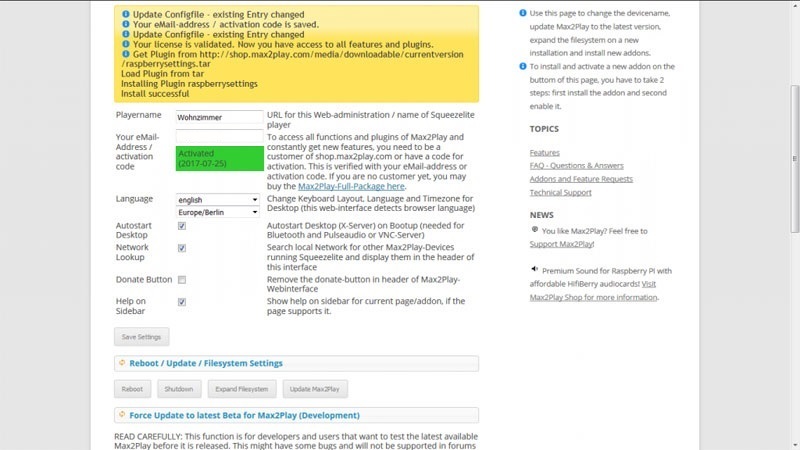 Thanks to the efforts of MHerger from the slimdevices forums and his Spotty Plugin, any Max2Play Squeezebox Server now comes with a direct integration for Spotify on all connected players, including a fresh integration of Spotify Connect. We recently updated our HowTo on Spotify to reflect this new feature. 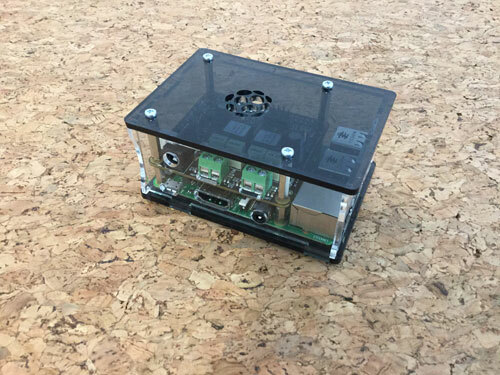 Hi Christoph, I really appreciate this post to build own multiroom audio system. It include few cables to control the system. AV system with optical input, AV system with optical input, AV system with RCA input, AV system with RCA input are best devices.